The study of particles is also a story of advanced technology begins with the search for the primary constituent. More than 200 subatomic particles have been discovered so far, all detected in sophisticated particle accelerators. However, most are not fundamental, most are composed of other, simpler particles. For example, Rutherford showed that the atom was composed of a nucleus and orbiting electrons. Later physicists showed that the nucleus was composed of neutrons and protons. More recent work has shown that protons and neutrons are composed of quarks. A quark is any of a group of subatomic particles believed to be among the fundamental constituents of matter. In much the same way that protons and neutrons make up atomic nuclei, these particles themselves are thought to consist of quarks. Quarks constitute all hadrons (baryons and mesons)--i.e., all particles that interact by means of the strong force, the force that binds the components of the nucleus. According to prevailing theory, quarks have mass and exhibit a spin (i.e., type of intrinsic angular momentum corresponding to a rotation around an axis through the particle). Quarks appear to be truly fundamental. They have no apparent structure; that is, they cannot be resolved into something smaller. Quarks always seem to occur in combination with other quarks or antiquarks, never alone. For years physicists have attempted to knock a quark out of a baryon in experiments with particle accelerators to observe it in a free state but have not yet succeeded in doing so. Throughout the 1960s theoretical physicists, trying to account for the ever-growing number of subatomic particles observed in experiments, considered the possibility that protons and neutrons were composed of smaller units of matter. In 1961 two physicists, Murray Gell-Mann of the United States and Yuval Ne`eman of Israel, proposed a particle classification scheme called the Eightfold Way, based on the mathematical symmetry group SU(3), that described strongly interacting particles in terms of building blocks. In 1964 Gell-Mann introduced the concept of quarks as a physical basis for the scheme, adopting the fanciful term from a passage in James Joyce's novel Finnegans Wake. (The American physicist George Zweig developed a similar theory independently that same year and called his fundamental particles "aces.") Gell-Mann's model provided a simple picture in which all mesons are shown as consisting of a quark and an antiquark and all baryons as composed of three quarks. It postulated the existence of three types of quarks, distinguished by distinctive "flavours." 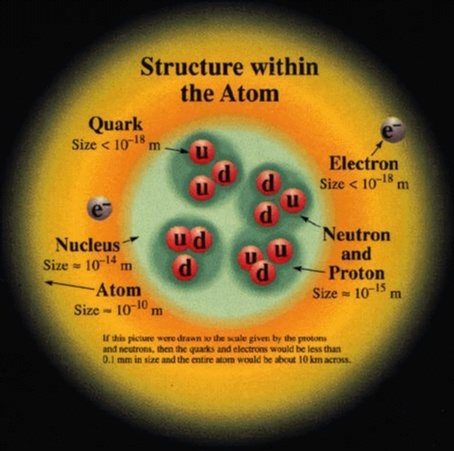 These three quark types are now commonly designated as "up" (u), "down" (d), and "strange" (s). Each carries a fractional electric charge (i.e., a charge less than that of the electron). The up and down quarks are thought to make up protons and neutrons and are thus the ones observed in ordinary matter. Strange quarks occur as components of K mesons and various other extremely short-lived subatomic particles that were first observed in cosmic rays but that play no part in ordinary matter. Most problems with quarks were resolved by the introduction of the concept of color, as formulated in quantum chromodynamics (QCD). In this theory of strong interactions, developed in 1977, the term color has nothing to do with the colors of the everyday world but rather represents a special quantum property of quarks. The colors red, green, and blue are ascribed to quarks, and their opposites, minus-red, minus-green, and minus-blue, to antiquarks. According to QCD, all combinations of quarks must contain equal mixtures of these imaginary colors so that they will cancel out one another, with the resulting particle having no net color. A baryon, for example, always consists of a combination of one red, one green, and one blue quark. The property of color in strong interactions plays a role analogous to an electric charge in electromagnetic interactions. Charge implies the exchange of photons between charged particles. Similarly, color involves the exchange of massless particles called gluons among quarks. Just as photons carry electromagnetic force, gluons transmit the forces that bind quarks together. Quarks change their color as they emit and absorb gluons, and the exchange of gluons maintains proper quark color distribution. Leptons are any member of a class of fermions that respond only to electromagnetic, weak, and gravitational forces and do not take part in strong interactions. Like all fermions, leptons have a half-integral spin. (In quantum-mechanical terms, spin constitutes the property of intrinsic angular momentum.) Leptons obey the Pauli exclusion principle, which prohibits any two identical fermions in a given population from occupying the same quantum state. Leptons are said to be fundamental particles; that is, they do not appear to be made up of smaller units of matter. Leptons can either carry one unit of electric charge or be neutral. The charged leptons are the electrons, muons, and taus. Each of these types has a negative charge and a distinct mass. Electrons, the lightest leptons, have a mass only 0.0005 that of a proton. Muons are heavier, having more than 200 times as much mass as electrons. Taus, in turn, are approximately 3,700 times more massive than electrons. Each charged lepton has an associated neutral partner, or neutrino (i.e., electron-, muon-, and tau-neutrino), that has no electric charge and no significant mass. Moreover, all leptons, including the neutrinos, have antiparticles called antileptons. The mass of the antileptons is identical to that of the leptons, but all of the other properties are reversed. The electron is the lightest stable subatomic particle known. It carries a negative charge which is considered the basic charge of electricity. An electron is nearly massless. It has a rest mass of 9.1x10-28 gram, which is only 0.0005 the mass of a proton. The electron reacts only by the electromagnetic, weak, and gravitational forces; it does not respond to the short-range strong nuclear force that acts between quarks and binds protons and neutrons in the atomic nucleus. The electron has an antimatter counterpart called the positron. This antiparticle has precisely the same mass and spin, but it carries a positive charge. If it meets an electron, both are annihilated in a burst of energy. Positrons are rare on the Earth, being produced only in high-energy processes (e.g., by cosmic rays) and live only for brief intervals before annihilation by electrons that abound everywhere. The electron was the first subatomic particle discovered. It was identified in 1897 by the British physicist J.J. Thomson during investigations of cathode rays. His discovery of electrons, which he initially called corpuscles, played a pivotal role in revolutionizing knowledge of atomic structure. Under ordinary conditions, electrons are bound to the positively charged nuclei of atoms by the attraction between opposite electric charges. In a neutral atom the number of electrons is identical to the number of positive charges on the nucleus. Any atom, however, may have more or fewer electrons than positive charges and thus be negatively or positively charged as a whole; these charged atoms are known as ions. Not all electrons are associated with atoms. Some occur in a free state with ions in the form of matter known as plasma. The first two you are familiar with, gravity is the attractive force between all matter, electromagnetic force describes the interaction of charged particles and magnetics. Light (photons) is explained by the interaction of electric and magnetic fields. The strong force binds quarks into protons, neutrons and mesons, and holds the nucleus of the atom together despite the repulsive electromagnetic force between protons. The weak force controls the radioactive decay of atomic nuclei and the reactions between leptons (electrons and neutrinos). Current physics (called quantum field theory) explains the exchange of energy in interactions by the use of force carriers, called bosons. The long range forces have zero mass force carriers, the graviton and the photon. These operate on scales larger than the solar system. Short range forces have very massive force carriers, the W+, W- and Z for the weak force, the gluon for the strong force. These operate on scales the size of atomic nuclei. So, although the strong force has the greatest strength, it also has the shortest range. Bosons are the particles which transmits the different forces between the matter particles, they normally have a whole number spin, 0, 1 or 2. And Fermions which are matter particles they often have spin 1/2. Real particles are the ones you are familiar with, all Fermions are real particles. The Bosons can sometimes be virtual and sometimes real. Virtual particles are the particles which transmits the force between the particles, e.g. virtual photon carries the electromagnetic force between e.g. electrons. They are called virtual particles because they can't be directly detected, you can't 'see' them so to speak. But their effect can be noticed, by e.g. the actual forces between particles. Quarks in baryons and mesons are bound together by the strong force in the form of the exchange of gluons. Much like how the electromagnetic force strength is determined by the amount of electric charge, the strong force strength is determined by a new quantity called color charge. Quarks come in three colors, red, blue and green (they are not actually colored, we just describe their color charge in these terms). So, unlike electromagnetic charges which come in two flavors (positive and negative or north and south poles), color charge in quarks comes in three types. And, just to be more confusing, color charge also has its anti-particle nature. So there is anti-red, anti-blue and anti-green. Gluons serve the function of carrying color when they interact with quarks. Baryons and mesons must have a mix of colors such that the result is white. For example, red, blue and green make white. Also red and anti-red make white.